Construction is currently underway on Michael Maltzan Architecture's Star Apartments - a new prefab apartment building in downtown LA for the Skid Row Housing Trust. Built on top of an existing 1-story building, the prefab apartments modules are being hoisted into place as we speak. When completed, the 102 unit apartment complex will provide housing for homeless people in the area and will also include a community center complete with a shared kitchen, a jogging track, basketball court, gym, art room, library, and community gardens. The prefab/renovation project is the only one of its kind in LA. Located at 6th Street and Maple Avenue along the border of Skid Row, Star Apartments is a new model for urban development. This is the third project by Michael Maltzan for Skid Row Housing Trust after both the Rainbow and New Carver Apartments. The site originally had a 1-story building and rather than tear it down, Michael Maltzan decided to build right on top of it with five-storys of community space and apartments. The project will have 102 efficiency apartments of permanent supportive housing for formerly homeless in the downtown core. The ground floor will be used as retail space, the first floor will be a community area with recreation and shared spaces, while the next four floors will be used for residences. The project was faced with a tight budget and time schedule, so the decision was made to go prefab in order to decrease construction time from 18-22 months to 13 months. The prefab modules are built by Guerdon Enterprises of Boise, Idaho and are now being craned into place. 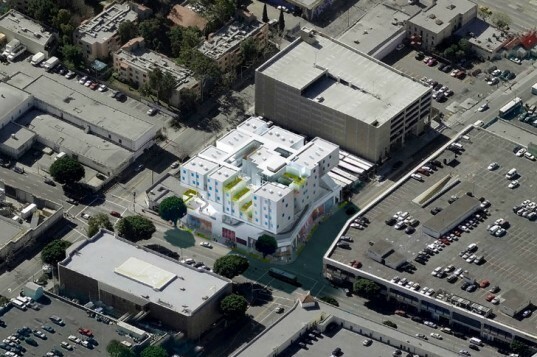 The 97,000 sq ft project will cost an estimated $20.5 million and is the first multi-unit housing project for homeless individuals to utilize prefabrication in the City of Los Angeles. The project is also on target for LEED certification and is targeting Platinum level. Construction is expected to be complete by 2013. Located at 6th Street and Maple Avenue along the border of Skid Row, Star Apartments is a new model for urban development. This is the third project by Michael Maltzan for Skid Row Housing Trust after both the Rainbow and New Carver Apartments. The site originally had a 1-story building and rather than tear it down, Michael Maltzan decided to build right on top of it with five-stories of community space and apartments. The project will have 102 efficiency apartments of permanent supportive housing for formerly homeless in the downtown core. The ground floor will be used as retail space, the first floor will be a community area with recreation and shared spaces, while the next four floors will be used for residences. The project was faced with a tight budget and time schedule, so the decision was made to go prefab in order to decrease construction time from 18-22 months down to 13 months. The prefab modules are built by Guerdon Enterprises of Boise, Idaho and are now being craned into place. 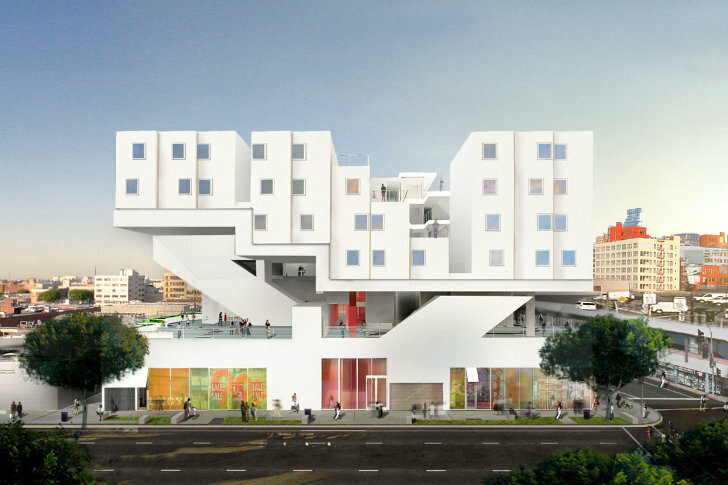 The 97,000 sq ft project will cost an estimated $20.5 million and is the first multi-unit housing project for homeless individuals to utilize prefabrication in the City of Los Angeles. The project is also on target for LEED certification and is targeting Platinum level. Construction is expected to be complete by 2013.